There's a big difference between hearing and listening. Do you know what it is? What is the difference between hearing and listening? According to auditory neuroscientist Seth S. Horowitz, the answer is attention. Hearing, he explains in a recent NY Times op-ed, is a passive action, an ever-engaged sense that is capable of not just perceiving, but triggering a reaction to, outside stimuli several times faster than our other senses — including sight. Horowitz equates hearing to an alarm system, a default setting that "operates out of line of sight and works even while you are asleep." 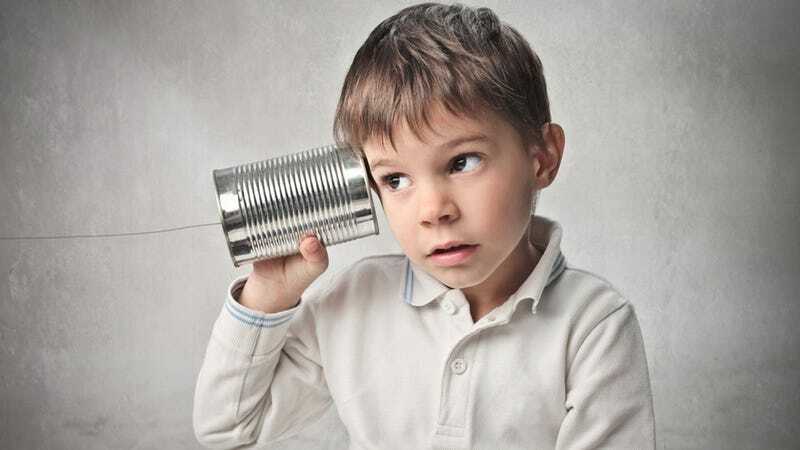 Listening on the other hand, is a decidedly active behavior, because listening requires focus. When you actually pay attention to something you're listening to, whether it is your favorite song or the cat meowing at dinnertime, a separate "top-down" pathway comes into play. Here, the signals are conveyed through a dorsal pathway in your cortex, part of the brain that does more computation, which lets you actively focus on what you're hearing and tune out sights and sounds that aren't as immediately important. In this case, your brain works like a set of noise-suppressing headphones, with the bottom-up pathways [active during passive "hearing" experiences] acting as a switch to interrupt if something more urgent - say, an airplane engine dropping through your bathroom ceiling - grabs your attention. Listening, Horowitz ultimately argues, is a skill — one that is capable of being not only honed, but lost. He then goes on to cite "digital distraction" and "information overload" as potential threats to an individual's ability to listen, something he suggests has "become an epidemic in a world that is exchanging convenience for content, speed for meaning." We're not sure we agree with Horowitz's conclusion. It's worth pointing out, for instance, that many of the techniques he suggests for "training our listening" (listen to new, rather than familiar, music; listen, not to your significant other's words, but to their voice) have been made more practicable by the same digital distractions he so vaguely condemns. Still, we loved his explanation of listening versus hearing, and his writeup does an excellent job of exploring the neuroanatomical differences between the two. And while his warning that "listening is a skill... we're in danger of losing" certainly smacks of melodrama, it is, at least, worthy of consideration. If nothing else, it's a nice reminder to stop and really listen — to someone, to something — for a change. Read Horowitz's full piece over at The New York Times.